It’s certainly been a case of all creatures great and small coming to visit us on Fraser Island over the past month – and our eagle-eyed twitchers and guests on our early morning bird walks and resort nature walks couldn’t have been happier. As the seasons changed on Fraser and we move steadily towards summer – we’ve seen our trees come alive with blossoms and seeds in the Wallum Heathland. This moveable feast has attracted all manner of birdlife including an Australian native – Bar-shouldered Doves - which are easily identified by the blue-grey breasted, chequered brown-bronze wings and striated nape feathers. November has also seen the arrival of a species we only ever see in summer - the very shy, rich-red Red Browed Finch. If its colour you’re looking for, we’ve got that too! 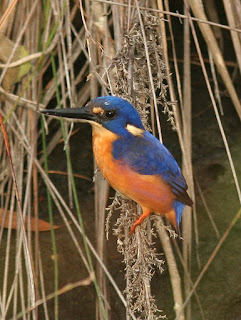 Regular sightings of the bashful electric blue Azure Kingfisher (pictured above left) – after which the resort is named - and the striking, tropical colours of the Rainbow Bee-eater filled the sky with florescent blues, greens, yellows and oranges and lots of ‘prrp prrp’ noises as they flitted through the wallum. 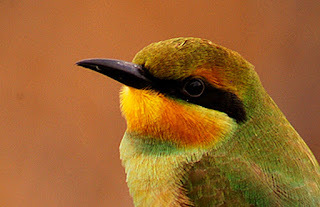 Birdy Fact: Did you know that Rainbow Bee-eaters rub bees and wasps against its perch to remove their stings before eating them? On the western beaches, we’ve seen Eastern Reef Egrets and White Faced Herons frolicking along the shoreline in search of a fresh seafood meal whilst Brahminy Kites and Whistling Kites – with their loud descending whistle (it sounds like ‘teee-titi’) - soared high above them also scanning the water for their next tasty treat of fresh fish. 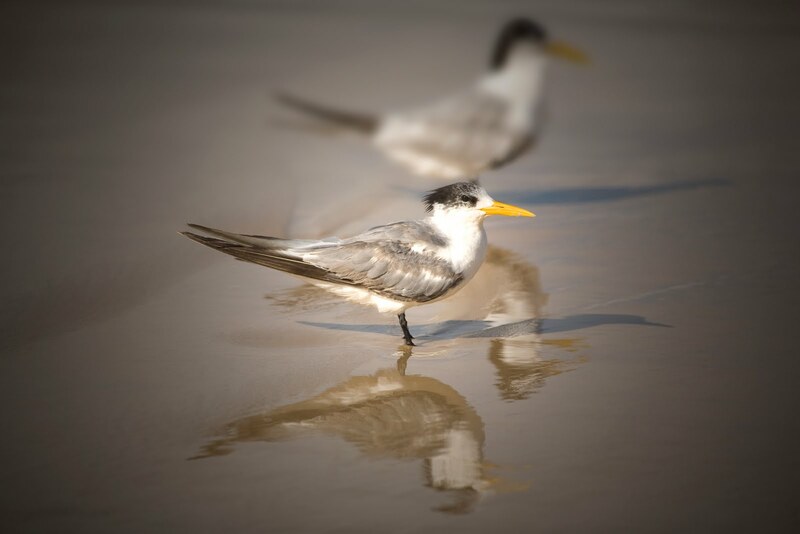 At this time of year, the waters of the Great Sandy Strait (which border Kingfisher Bay’s resort grounds to the west) are full of large schools of bait fish – making them perfect feeding grounds for our Gull-billed Terns and Crested Terns. This month we’ve watched as they’ve dive bombed into the water – only to come fluttering back out with a prized fish in their beak. There's been plenty of great photographic opportunities. Overall November was magical for bird spotters. Our feathered friends have played, posed and paraded around for all to admire and we've loved every minute. Until next blog, this is Ranger Kat signing off. More From Our September Flockstars! Spring has sprung and what a beautiful time of year it is here at Kingfisher Bay Resort. 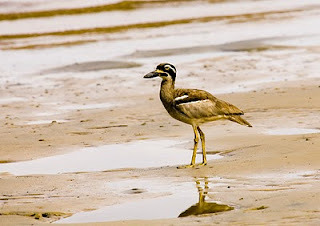 The resort's Wallum is simply teeming with bird life as Fraser Island's wild flowers have burst into bloom. The aromatic and nectar filled flower spikes of Forest Grasstrees continue to attract Honeyeaters from far and wide. Dusky Honeyeaters, Scarlet Honeyeaters, White Throated Honeyeaters and Blue-faced Honeyeaters could all be seen gorging themselves on the nectar. The beautiful red inflorescences of the Bottlebrush are also in bloom and are equally as attractive at mealtime for our resident Honeyeaters. Birding along the main road was stunning this month and our eagle-eyed twitchers spotted Emerald Doves on three separate occasions. These striking birds, with their iridescent green wings, are mainly found in rainforest and rarely seen within the resort grounds, causing our Rangers to do a double-take! Adorable Eastern Yellow Robins were also spotted on several mornings flitting through the undergrowth, collecting twigs to construct their tiny nests. Fraser’s resident flower peckers - Mistletoebirds - were also seen on several September mornings - happily picking fruit from clusters of Mistletoe high amongst the Eucalypts. There was plenty of activity down on Fraser Island’s western beach with many of our magnificent raptors making an appearance. Whistling Kites and Brahminy Kites were seen on many mornings soaring gracefully over the Great Sandy Strait scanning the waters for fish prey. Ospreys and White-bellied Sea-Eagles were happy for us to watch them as they perched majestically in beach side Eucalypts. We’re pleased to report that our Rainbow Bee-eaters (pictured) are back on island! 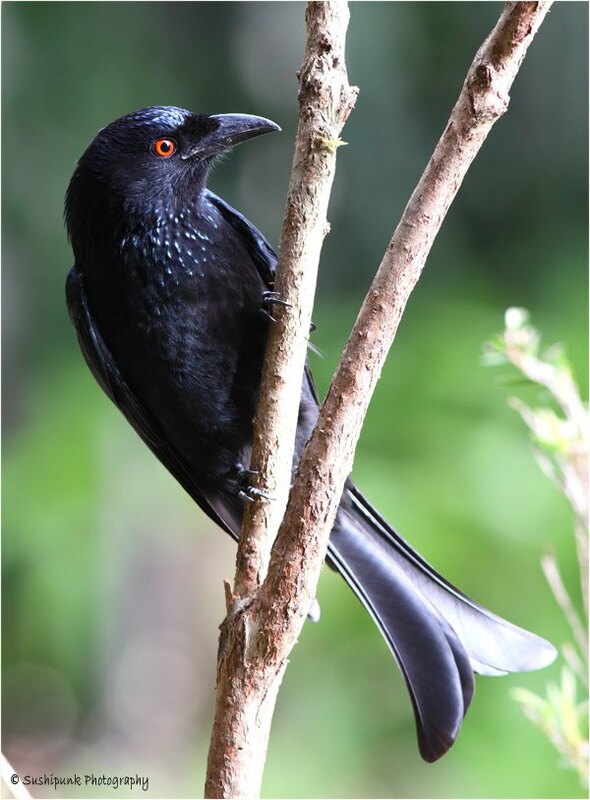 These stunning birds can migrate all the way to Papua New Guinea during winter but their return to Fraser’s shores is a sure sign that spring is here! Hooroo until next month, Ranger Kat. The arrival of spring and the abundance of nocturnal wildlife - spotted on our nightly guided walks - made us get through September on Fraser Island with a spring in our step. It was business as normal for our usual suspects - the Squirrel Gliders and Fruit Bats - in and around Kingfisher Bay Resort - who were seen indulging in the rich array of nectar filled blossoms. However, it was our Fraser Island reptiles that really impressed Rangers and guests alike this month. A beautifully sound-track comprising the choruses of various native frog species provided a perfect accompaniment to our nightly wanderings... and from September 1 we were off to a fantastic start. Notable amphibian sightings included rare Striped Rocket Frogs and the Cooloola Sedge Frog, plus additional reptile sightings of Asian Wood geckoes and a beautiful Carpet Python (see above). But the fun didn't just happen on land... in the calm waters of the Great Sandy Strait, a number of larger fish species were spotted off the resort's jetty stalking the shallows for prey. A sizable Barramundi and two sightings of large Barracudas left us in awe of their sheer size and grace in the water. Two particular species of birds also made regular appearances this month. 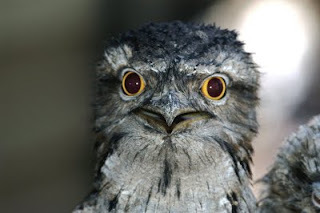 A Tawny Frogmouth, sitting silently on a eucalypt branch, was quiet happy for us to pop in and say g'day on many a night. And on one of our Wallum walks, we stumbled across two Pacific Black Ducks quietly roosting on the shore of one of our window lakes. The clear, Spring nights made this month's night walks truly memorable. We think it was the combination of new spring-time animal sightings, alongside our old favourites, and some spectacular clear night skies above Fraser - including one where we saw plenty of shooting stars. Until next month, hooroo for now. Ranger Kat. Winter has started with near-perfect conditions for spotting some of the Fraser Island’s more elusive nocturnal animals. The still air and wonderfully clear nights have resulted in spectacular star gazing and animal spotting. Our little furry friends in the trees have continued to put on magnificent aerial displays throughout the month, with regular sightings of Squirrel Gliders, Sugar Gliders and the occasional Feather-Tail Glider. Once again these aerobatic marsupials have impressed with their gliding skills and territorial displays - with one Sugar Glider fiercely defending its branch of blossoms from a Grey-Headed Flying Fox. Down on ground-level we have had a variety of animal sightings ranging from mammals, to reptiles, and amphibians to arachnids! A rare sighting of two amphibians – the Striped Rocket Frog and the Wallum Rocket Frog – added to the excitement along with the amazing behavioural adaptations of the Net-Casting Spider. 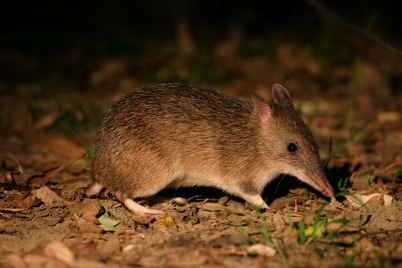 A greater number of Bandicoots (pictured above left) have been spotted this month, with some of these normally shy creatures seemingly undisturbed by our shining torches! 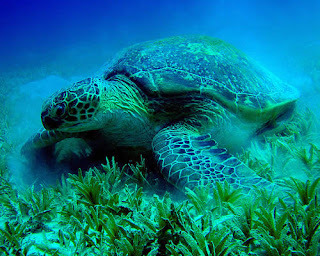 The beach once again produced the usual array of marine life for us to spot, however the notable sighting of a Green Sea Turtle topped off what was a truly magnificent month of night-walking! Who knows what July will bring – we’ll keep you posted. Ranger Kat and the team. 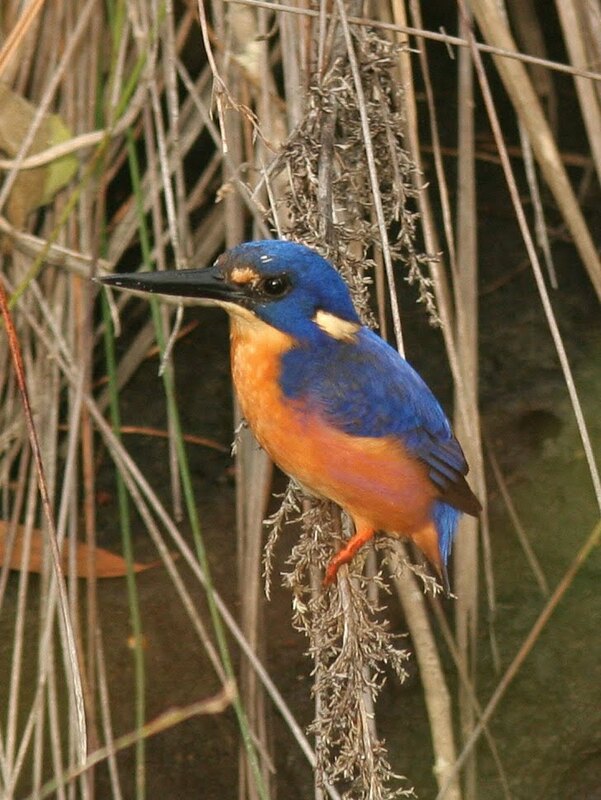 The first month of winter has brought with it some amazing bird sightings in and around Kingfisher Bay! Plenty of guests braved the brisk early morning air and the birding rewards were worth it. The Wallum teamed with life as usual this month with the quavering calls of Varied Trillers ringing in the morning chorus most days. 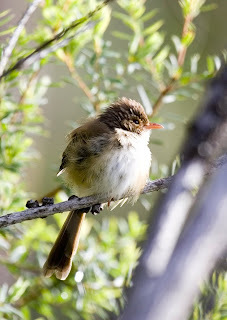 Pairs of Eastern Whipbirds were heard most mornings calling back and forth to each other through the dense undergrowth. 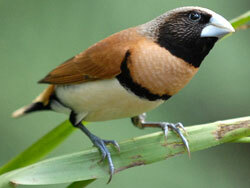 The melodic calls of the Rufous Whistler were also often heard from amongst the Casuarinas. The resort’s lakes were graced with the presence of a Little Egret this month. This majestic creature was seen on many of our early morning bird walks - gracefully treading through the grassy banks and probing the soft soil for its morning meal. 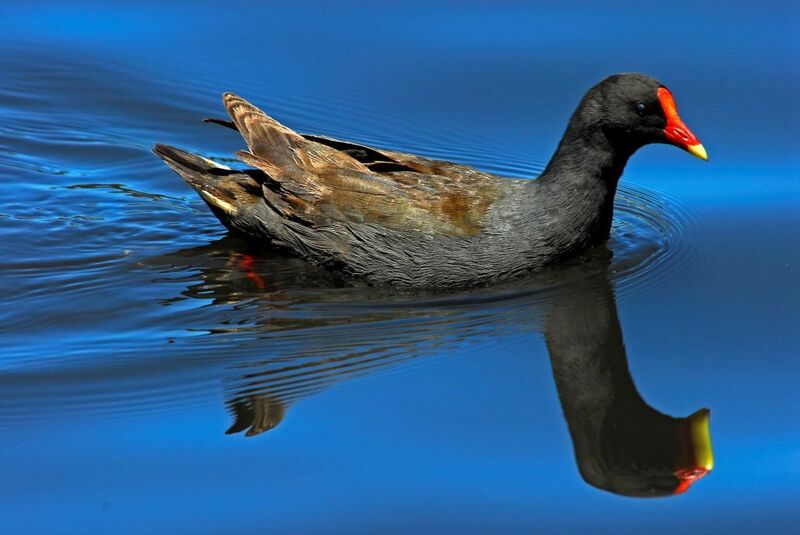 We also greeted two new additions to the Wallum lakes this month - with a pair of Australasian Grebes spotted on a number of occasions quietly paddling amongst the reeds. Down by sunset beach White-breasted Woodswallows (pictured above right) have returned in their dozens, favouring a particular Eucalypt. These adorable birds were observed several mornings huddled together along its branches aiming to catch the first rays of warming sun as it crept over the dunes. Our magnificent birds of prey were also out and about this month. Ospreys, Whistling Kites, Brahminy Kites and a White-bellied Sea Eagle were all observed taking advantage of the superb visibility of the Great Sandy Strait’s crystal clear waters; perfect for catching fish prey! Can’t wait to see what our feathered friends are up to next month – catch you then. 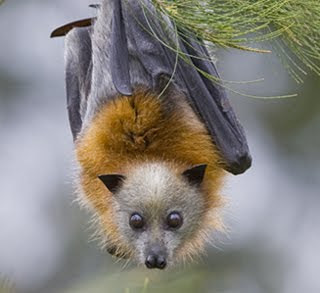 We're Just Batty About May On Fraser! Hi there Tree Huggers - winter is almost upon us with cooler mornings, warmer May days and perfectly clear blue skies… this time of the year is just perfect for spotting nocturnal wildlife! Our Squirrel Glider population were the most active they’ve been all year. These adorable little creatures could be seen feasting on flowers high in the Eucalypts and squabbling amongst each other. Night walkers were delighted as they leapt from the edge of the branches and glided gracefully to the next tree! Yet more guests on a night walk were lucky enough to spot a large Carpet Python slowly slithering its way up a tree in the Wallum - proving we weren't the only wildlife watching the Gliders! The various lakes around the resort grounds have been a hot spot for wildlife. Microbats (pictured top - photo courtesy of DERM) busily went about catching their evening meal oblivious to the walkers below them watching fascinated. These tiny creatures display amazing aerobatics as they soar within millimetres of the water – skimming insects sitting on the surface. 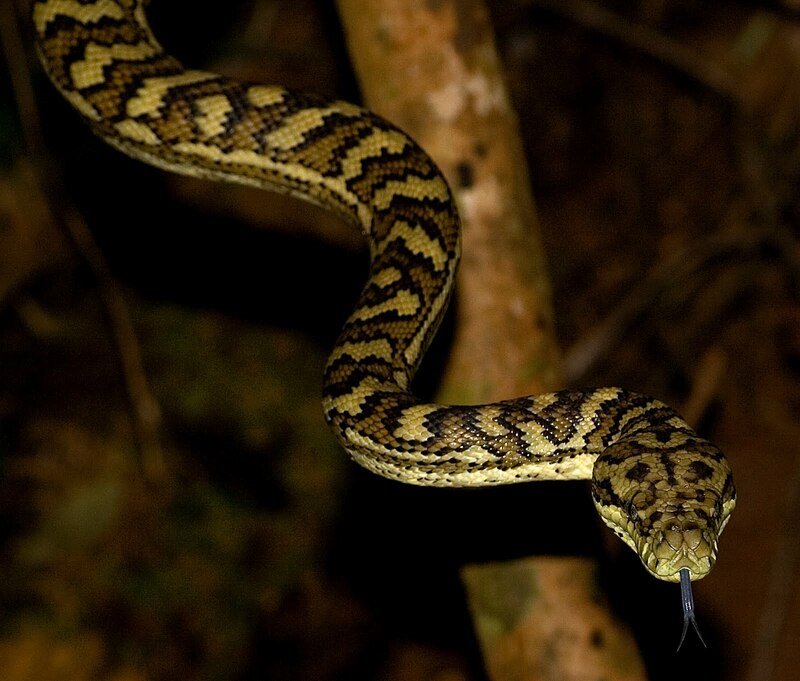 Attracted by our night walk spotlight, they sometimes came within millimetres of our faces! The usual suspects congregated under the jetty during May. Estuary and Blue Spotted Stingrays cruised the sandy bottom, with the occasional Shovel-Nosed Ray and Flathead fish joining in the fishy fun. Schools of Herring brought the dark waters to life, and these skittish fish jumped out of the water in all directions when exposed to the spotlight – the kids on the walks loved it... and so did the big kids. Also this month, several large Squid could be seen using cunning camouflage techniques to hunt their fish prey. We look forward to seeing what sort of wildlife winter brings – see you next month. Warm May Days Serve Up Some Hot Bird Spotting! As the autumn season comes to a close, the morning sun starts to creep over the sand dunes later and later – which means we can sleep in longer, before heading out on our early morning bird walks. While crawling out of a warm bed becomes increasingly difficult, for any Birder intrepid enough, this month has proved that now is the perfect time for spotting our amazing avian residents. The sweetly scented blossoms of the resort’s Swamp Mahoganies have drawn in an array of magnificent bird life. Rainbow Lorikeets, Noisy Friarbirds, Spangled Drongos, White-Throated and Lewin’s Honeyeaters were all seen feasting noisily on the abundant nectar these plants produce. The various flowering Paperbarks around the Wallum were also teaming with our smaller feathered residents as Scarlet, Dusky and White-Cheeked Honeyeaters busily flitted from flower to flower. This month also marked by several rare and unusual sightings, much to the delight of guests and rangers alike. 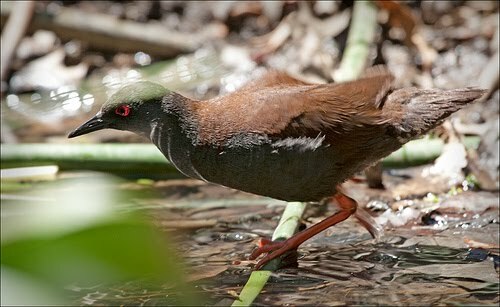 Chestnut Breasted Manikins (pictured above) were sighted down by Dundonga Creek, the first Buff-banded Rail sighting in years occurred on the bank of one of the resort’s lakes and flocks of rarely seen Topknot Pigeons have been spotted on several mornings soaring over the resort grounds. Both male and female Australasian Figbirds were also sighted in the Wallum. These quiet and unassuming birds made for delightful additions to this month’s bird walks and have certainly given us something to tweet about. Autumn at Kingfisher Bay has well and truly sprung... and April has seen some boisterous behaviour around the resort with pairs of Flying Foxes - both Grey-Headed and Little Red species - regularly seen hanging in trees above. These somewhat noisy critters have been quarrelling over the sweetly scented nectar of Swamp Mahogany blossoms and have put on quite a show during this month’s night walks. Gliders were also regularly spotted in April. Fortunately for our guests, as winter approaches and the resort’s various Eucalypt species begin to flower prolifically, they will become more and more abundant. 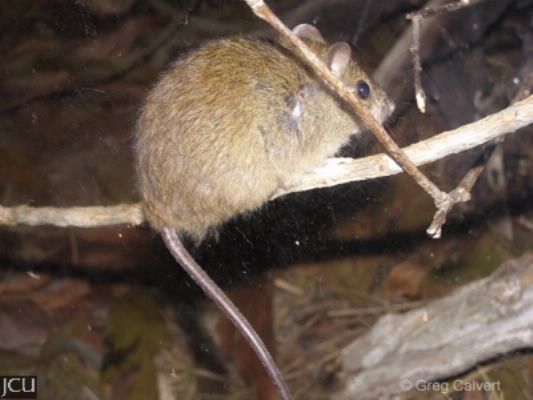 Feathertail Gliders, however, have proven more elusive than their Squirrel Glider mates. These minute marsupials hold the title of the smallest gliding mammal in the world and are a real delight to see in action. 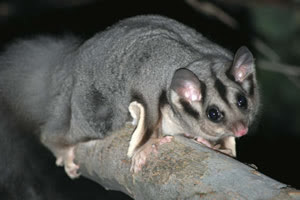 This month a lone Feathertail Glider was spotted scampering through a Swamp Mahogany - and we loved it. From the small critters on Fraser to the very largest… there are just a couple of months until the start of Whale Watching season at the resort – with the season splashing down from August 1. Our friends at Air Fraser spotted the first Humpbacks (pictured left) of the season migrating north (in the open ocean off Fraser Island's eastern beach) just a few days ago. It’s when they begin their migration south that the magic happens. Hervey Bay is one of only two places in the world – Hawaii is the other – where Humpbacks take time out of their migration schedule to wallow and socialise in the warm waters off Fraser Island. It’s great for the whales and great for the Bay as we serve up some of the best Whale Watching in the world! Those same calm clear waters on the western side of Fraser proved popular with both experienced and amateur fisher folk alike over the past month. Large Flathead could be found lying in wait in the shallow water and several tasty looking Mud Crabs were also spotted around the jetty. Though perhaps more exciting was the great number of Banana Prawns around this month. 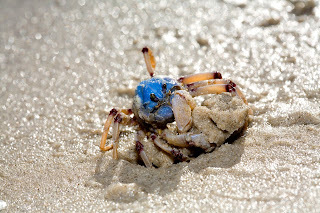 These cute crustaceans could be seen frolicking in the shallow water, jumping about with legs flailing and tails fanned. 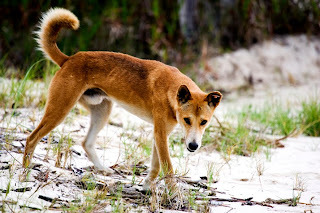 We're wild about Fraser Island - hope you are too. Until next time, this is Ranger Kat signing off. Forget Noah and his animals marching two-by-two onto the ark, April was the month to pair up in the Bird World, with several different species exhibiting courtship behaviour at Kingfisher Bay Resort. Down near the beach we recorded pairs of beautiful Brahminy Kites flying side by side; Spangled Drongos (pictured right - photo by Sushi Photography) were spotted participating in what appeared to be courtship feeding; and Pied Oystercatchers were spotted quietly foraging together along the sandy beach strip. 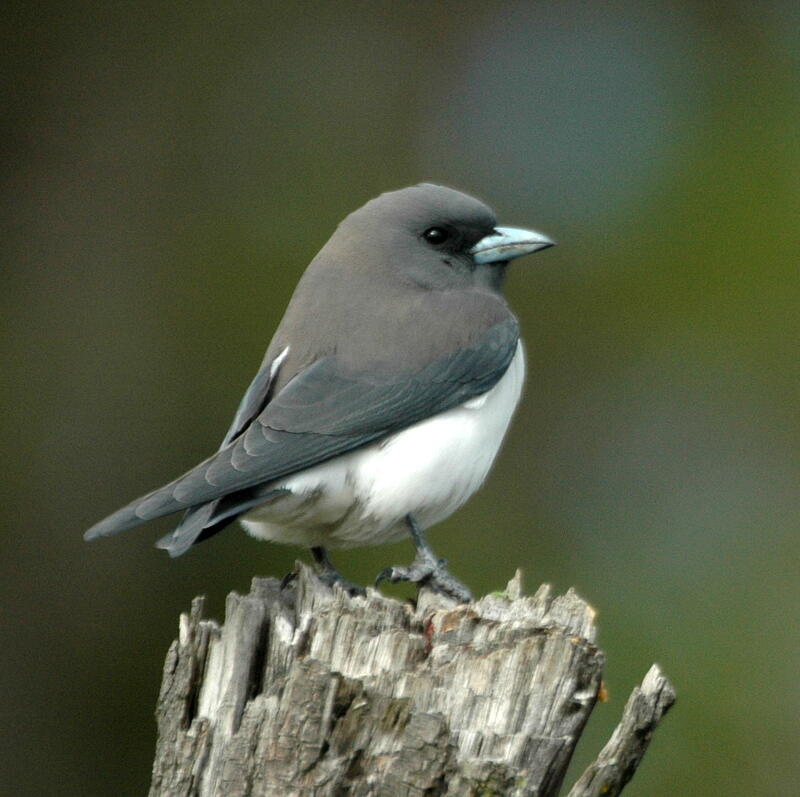 Not to be outdone, mating pairs of White Breasted Woodswallows were also seen busily preparing a nest high in dead tree hollow. Around the Wallum this month, the skies were filled with noise as the unmistakable calls of Sulphur Crested Cockatoos and Rainbow Lorikeets, which dominated the morning chorus. These colourful characters are not found on the island all year round, instead they flock in droves in the cooler months to feast on the nectar of flowering Swamp Mahogany. A lone Little Pied Cormorant also graced us with its presence on several occasions - either fast asleep on a Paperbark branch around the banks of the resort’s lakes, or bobbing around in the water under the jetty searching for a fishy meal. 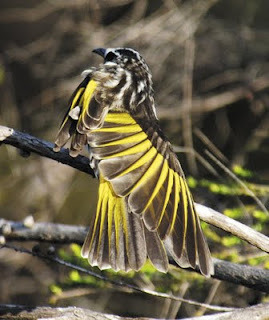 Along the resort’s main road Laughing Kookaburras perched themselves on overhanging branches and, on the ground, Grey Shrike Thrushes and Bar Shouldered Doves foraged through the leaf litter in search of insects and seeds and amongst the Eucalypts. Mistletoe Birds could be seen busily searching for Mistletoe fruit. From Ranger Kat, and her feathered flockstars, we’re signing off until next month. During March we looked again to the trees for signs of life with Tawny Frogmouths and Squirrel Gliders (pictured left) both regularly sighted on night walks. Frogmouths are the masters of camouflage during the day as they blend in amongst the rough bark of different tree species. At night however, they become stealthy hunters and can often be seen swooping down to the ground to snap up juicy insects. So too, our Glider population are always entertaining as they scamper through the trees with effortless ease. Squirrel Gliders, although small, can glide up to 50 metres between trees and it's quite a sight to see! 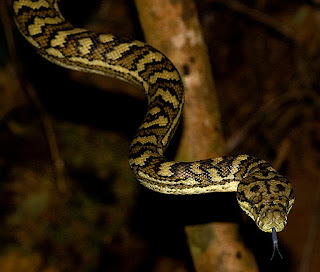 Some of Fraser Island’s snake species made an appearance - with pythons being sighted on several night walks. These docile nocturnal creatures move unassumingly through their Wallum home, no doubt in search of a tasty amphibian meal. Carpet Pythons can grow up to four metres in length and on one particular night guests were delighted to witness not one but two of these beauties in plain view as they lay on the bitumen road – well away from human activity - absorbing the day’s residual heat. Off the Jetty this month Estuary Stingrays were about as usual, as were several different types of Baitfish that inhabit the clear calm waters of the Great Sandy Strait and Hervey Bay. However, it was the Eastern Shovel-nosed Rays that seemed to want to hang with us this month. These interesting creatures have the distinctive head of a Ray and the body of a Shark and, at night, can be seen gliding through the shallow waters in search of crustaceans, molluscs living under the sand. Catch you for the April 'creatures of the night' round-up here on Fraser Island, cheers Ranger Kat. The beautiful waters of Hervey Bay's Great Sandy Strait were the perfect place to spot some of our amazing marine life this month. Loggerhead Turtles were spotted on two different occasions from the resort jetty – which was fabulous - and on many nights Squid of varying sizes could be seen gracefully gliding through the calm clear waters. The jetty was also the perfect place to marvel at the thousands of Soldier Crabs (pictured above) that emerge to feed at low tide. These small, spider-like crustaceans form impressive gatherings or ‘armies’ at the tide line and busily go about feeding on organic matter that has settled in the sand. Around the window lakes this month nocturnal predators, including the Long Finned Eels, could be seen darting in and out amongst the vegetation busily hunting mosquito fish and various aquatic insects. An unusual and, as it turned out, regular evening visitor around the resort’s lakes this month was a lone Pacific Black Duck! This cunning creature managed to avoid the eagle-eyes of our early morning bird walkers, preferring to wander the banks of the main lake in the Wallum – much to the delight of our night guests. This month’s night walks were also characterised by a stunning array of everyone’s favourite creepy crawlies…Spiders. The infamous, but quite harmless, Huntsman Spiders were spotted and the group watched in awe, on night, as the spider subdued and devoured a Cicada. The impressive web building Garden Orb Weavers and ground dwelling Wolf Spiders were also encountered. Our usual array of furry friends were out and about this month as well. Squirrel Gliders were regularly seen feasting on the flowering Blackbutts near the resort’s round-about. Bandicoots weren’t as active this month with only a couple of sightings made and the elusive Grassland Melomys were occasionally seen darting through the dense Wallum vegetation. A great month was had by all… and we wait with baited breath to see what critters and creatures come out to play in autumn. Catch you all again 'real' soon, Ranger Kat. G’day nature lovers, as we waved goodbye to the last weeks of summer, February produced some exhilarating bird watching, and some impressive feathered visitors made cameos in and around Kingfisher Bay Resort. The White Bellied Sea Eagle is more commonly seen on the eastern side of Fraser Island, but the breezy weather on the western beach this month provided the perfect conditions for our largest bird of prey. Guests on the bird walks, and eco walks for that matter, watched transfixed as these giant creatures soared majestically overhead on thermal currents. One even landed in a nearby Eucalypt making for excellent close-up viewing of its striking plumage and powerful talons – not to mention some great ‘happy snaps’ for the collection. 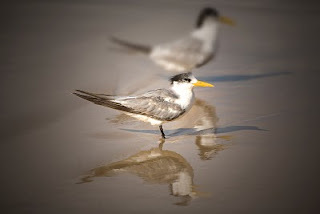 Crested Terns (pictured above right) were also regularly sighted on the beach this month, no doubt taking advantage of the large number of bait fish present in the calm clear waters at the moment. Several of the less common Caspian Terns were also recorded. As the name suggests Kingfisher Bay Resirt is a pretty good place to spot a Kingfisher… and this month we’re recorded sightings of the three different species known to reside in and around the resort. The Azure Kingfisher with its vibrant orange and blue plumage was seen around the resorts lakes, while the Forest Kingfisher and Sacred Kingfisher spent their mornings scouring the beach for tasty crustaceans – and that’s where we were. February was also a very colourful month with quite a few Rainbow Lorikeets sighted. These charismatic birds were hardly seen during the first half of summer, but joined us to feed on the Bloodwoods and Blackbutts that have been flowering throughout the month. Mistletoebirds were also regularly spotted through the Wallum and amongst the paperbarks around the tennis courts. These gorgeous little birds, with their striking red, black and white plumage, are always a delightful addition to any morning’s sightings. By far and away the most unusual sighting this month was of a pair of Brown Thornbills, spotted behind the resort’s Centre Complex. We’ve not seen any Thornbills so far this year, so their presence was a welcome surprise. As we head into autumn, we look forward to the 10th anniversary of Fraser Island Bird Week… if you love nature, featured friends, good company and Fraser Island – consider coming to visit for a few days during this time. 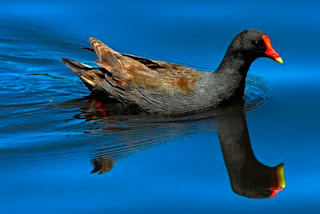 All details are on our website – www.birdwatching.kingfisherbay.com. This is Ranger Kat saying hooroo for now. Summer is truly here. The island days have become warmer and this, combined with the influx of holidaying guests, has created a flutter of activity at Kingfisher Bay. With the change of season, we've really had something to crow about on our bird walks as we've seen several exciting and rarely-seen bird species making the daily December bird list. We started the month watching a nesting pair of White-Breasted Woodswallows. These birds were spotted down near the beach one morning zipping in and out of a dead eucalypt... where they'd chosen to nest. On another December day we were enthralled as a Beach Stone Curlew (pictured) faced off against a dingo on Fraser's western beach! While the dingo was only mildly interested in the large shorebird, the distressed curlew repeatedly charged at the predator in an aggressive display. It really was fascinating to watch. While the flowering grass trees provided plenty of nectar for honeyeaters during spring, the summer seeding provided an attractive food source for many Sulphur Crested Cockatoos. It was quite amusing as these large white parrots flocked to the Wallum, landing on these slender grass tree stems, which bowed heavily under their weight. While the larger birds definitely made an impression this month, Fraser Island’s smaller feathered residents were not overlooked with regular sightings of Mistletoebirds, Leaden Flycatchers and Red Browed Finches. The Kingfisher Bay family also grew by three, as our resident Grey Shrike Thrushes produced a clutch of eggs in their nest (which is conveniently located in our Centre Complex near reception). Once again the 'clucky' Rangers were kept busy protecting adventurous fledglings from the hustle and bustle of summer at Kingfisher Bay. Here's tweeting you - til next time... hooroo! The warm December nights and higher than average rainfall last month meant our night walk sightings lists were dominated by reptiles and amphibians! Striped Rocket Frogs and Wallum Rocket Frogs dominated the wallum night chorus, delighting guests as they hurtled themselves across the path in a seemingly directionless trajectory! Less common sightings included the delicate Cooloola Sedge Frog (pictured) - easily recognisable due to its petite size and pale green skin. Slithery specimens included a Carpet Python and a Brown Tree Snake, however the regular rainfall meant that snake sightings were not commonplace. The most delightful reptile sighting was actually of a Green Sea Turtle, which had found a place to sleep amongst the rocks supporting the boat ramp at the jetty. Their shells mimic barnacle-covered rocks so well, that on many nights identification was only possible due the beautiful creature’s flippers sticking out from its shell! Other than the slimy and the scaly residents there was the occasional sighting of a Squirrel Glider or two; however the rain and lack of tasty blossoms meant they remained relatively quiet during December. Micro bats were however out in force, darting above our heads stealthily locating their prey. The change in season has brought about some large Hawk Moths which would make a very substantial meal for a small bat. 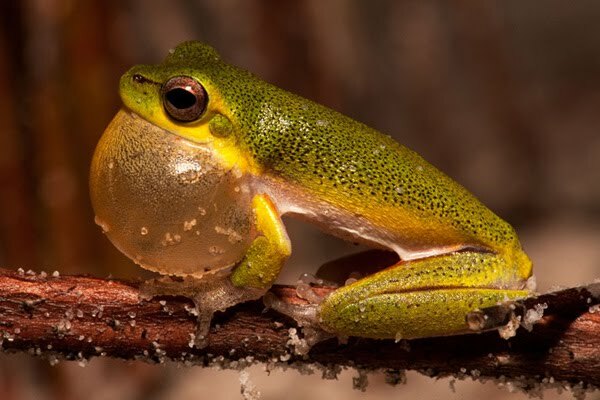 With the resort's lakes already full, the warm summer temperatures and the weather, it appears that Kingfisher Bay will continue to serve as a haven for all things amphibian - and that's the way we like it. Catch you next month!